The high-impact concept of a new Delancey Street crossing. 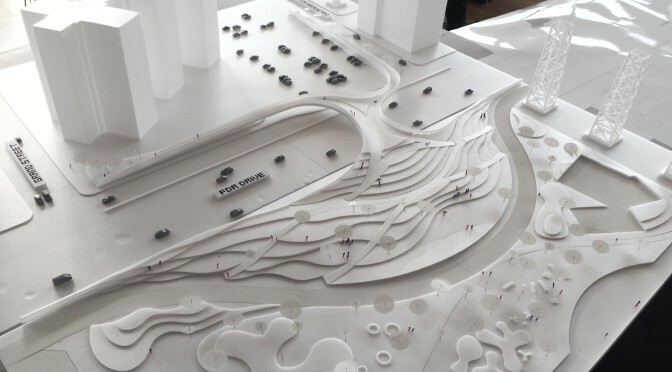 Imagine a sloping landscape that blocks traffic noise from East River Park and keeps floods from washing away our cars. Imagine an entrance to the waterfront that starts right at the foot of Grand Street. Imagine walking on a bridge over the highway and already being in the park. Now imagine five years of construction, and a long concrete ramp permanently installed right outside your front door. 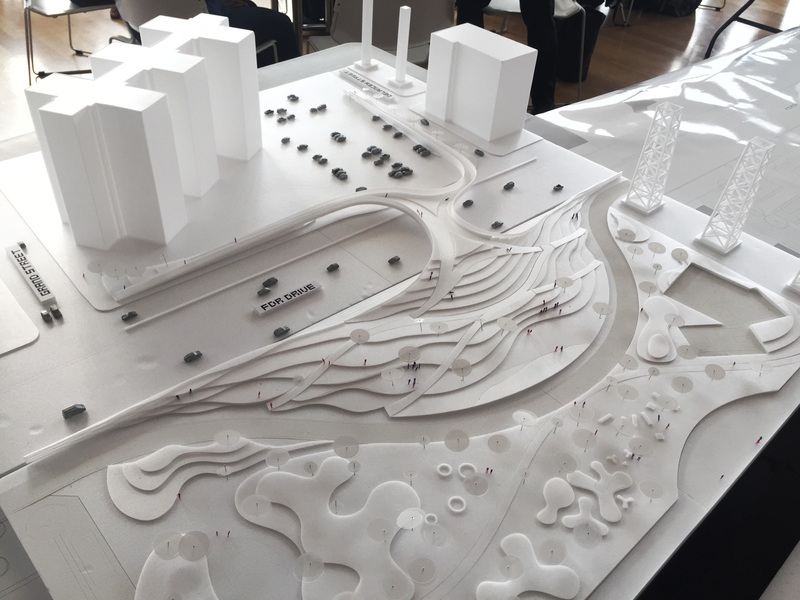 All this and more is what community members were asked to imagine last night as the design team behind the East Side Coastal Resiliency Project (the Big U, the Dryline) presented concept designs for each of four FDR Drive crossings. After Sandy, federal recovery money was allocated to storm surge protection along the East River from 23rd Street down to Montgomery. This area represents low-lying neighborhoods vulnerable to flood, and, crucially, is home to the Con Ed plant that powers almost all of lower Manhattan. Workshop leaders discussed four current bridges that take pedestrians into East River Park — at 10th Street, 6th Street, Houston, and Delancey — and presented three design options for each one that ranged from low-impact (and lower cost) to expansive (and expensive) redesign. They explained that the money to erect flood walls, berms (wide, gradual slopes), and deployable storm surge barriers was also an opportunity to increase access to East River Park and improve our neighborhood’s connection to the waterfront. As such, the pedestrian crossings are being looked at closely to determine how to make them more accessible (not as steep, better positioned), and more integrated into the park. 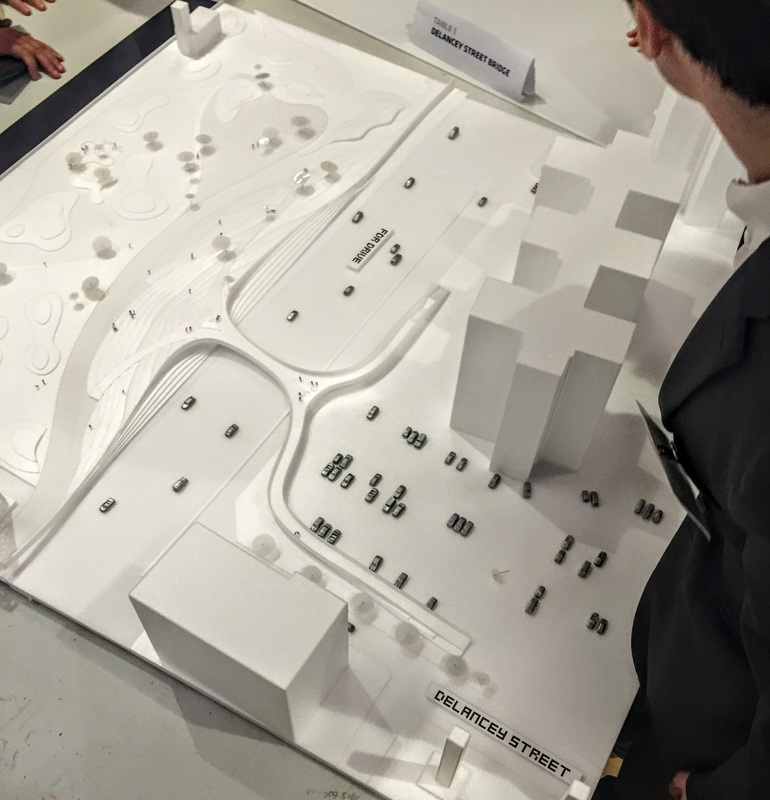 For Delancey Street, the possibilities were eye-opening. From previous workshops, planners had been told that the bridge was too noisy (so close to the Williamsburgh Bridge traffic) and not accessible enough to Grand Street. So the high-impact concept they presented pulls the bridge away from Delancey and places one ramp along the FDR access road, right in front of building 4, letting out on the corner of Grand. The design was curved and beautiful, and, as all architectural models look, it felt utopian and aspirational. Of course, for those people who live in building 4, on the lower floors perhaps, the prospect of a pedestrian bridge out your window might seem like the end of the world. The Goldilocks version for Delancey, narrower but still reaching toward Grand Street. There were lots of caveats: these are concepts only, and the designers seem eager to get feedback and see the challenge from all angles. Board member Lee Berman was at the workshop, along with House Committee members Jeff Super and Ellen Renstrom, and other East River cooperators. Lee spoke with project planners after the presentation and initiated the arrangement of a stakeholders meeting right here at East River, as the redesign of the Delancey Street crossing, one way or another, will obviously have a big impact on our coop. One last note: The Corlears Hook bridge was left out of the workshop for a simple reason — it already embodies many of the concepts the designers are trying to incorporate elsewhere. The bridge is wide, it is already part of the park, and the amphitheatre is already built up like a berm to cut off flood waters. Aside from better lighting and other cosmetics, designers are not likely to spent too much of their money making alterations there.